Before enrolling at the School of International Service, Benjamin Lundin traveled for three years. From Madrid to Chile, and then to Scotland, he worked as an English teacher, as a school administrator, and as a Legislative Aide at the Scottish Parliament. Traveling became part of his life. When Ben was considering graduate schools, he wanted to find a program that combined his interest in international affairs with his passion for business and economics. The Master of Arts in International Economic Relations at the School of International Service was a perfect fit. 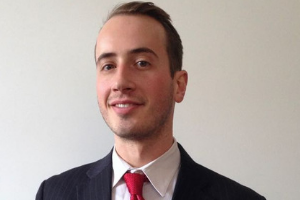 In addition to being a full-time student, Ben works as a Teaching Assistant and has a full-time job at the Carnegie Endowment for International Peace. “Although it can be stressful, I spent the larger part of the last three years traveling and having fun, so I feel like in a way this is me making up for all of that time I spent living abroad,” he jokes. Ben also wanted to enhance his educational experience by incorporating travel, a passion of his, into his schedule. American University offered the perfect solution. A study abroad program at The Graduate Institute, Geneva! In Geneva Ben was able to study, travel and visit his family in Switzerland. He took seminars on migration, terrorism, global warming and international trade with leading experts in international affairs. He visited the United Nations, the Red Cross, and the World Health Organization, and got to attend a panel discussion on the Brexit Negotiations with Liam Fox, Secretary of State for International Trade for the United Kingdom. Of course, his busy course load was combined with some tourism time. “This program was one of the most formative I have had in my time at AU. It was hands-on, extremely relevant and timely,” he says. During his time in Geneva, Ben discovered the key role that young scholars play in shaping the international order. Ben got to build a network with accomplished academics, students from around the world, and policymakers at international organizations. Ben aspires to work in consulting for multinational corporations upon graduation. The program at the Graduate Institute of Geneva left Ben well-equipped with the necessary problem-solving and decision-making tools for the challenges ahead of him.